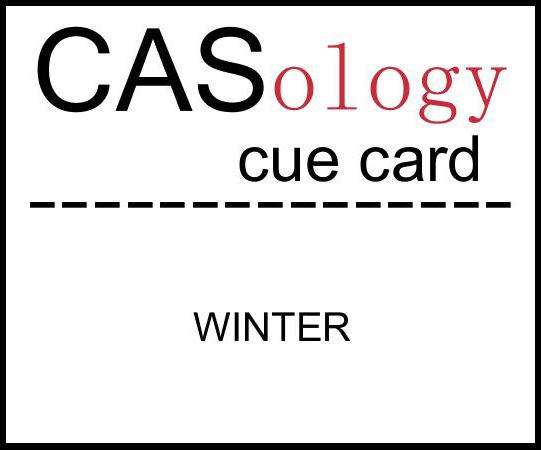 This week's CASology Cue Card is Winter! This card looks so calm and peaceful, doesn't it? But don't let it fool you! After nearly two weeks of very little crafting time, I had absolutely no mojo and no idea what to make for a winter card. Once Christmas is done, I think winter should be too! I went through all my stamps over and over, looking for inspiration. Trawled through Pinterest, hundreds of blogs. Made 3 or 4 different card front panels, feeling clumsy with my cutter and my Copics (lack of practice!). Finally as the light was fading, I came back to this stamp. It's an old Stampin' Up Hostess set called Gently Falling. I threw caution to the wind and stamped it in the middle of the panel without even using a stamp positioner. The sky is inked with my blue Kaleidecolor ink pad and the sentiment is black. And in the end, I think it really does convey the silent, peaceful feeling of heavy snow falling on a dark winter night. Fortunately, it doesn't convey the hurricane that went through my craft room getting to this! It's just lovely and seems worth the whirlwind effect that has subsequently befallen your crafting area! You not using a stamp positioner!! (I threw mine into the wind years ago). Anyway, your stamp landed perfectly, and the sentiment is perfect for the image. It does look very peaceful. I love the colors and simplicity of this card! Love the subtle color change that is very effective and so nice. Wow, amazing card! and positioning it just so! Great! Oh my.... this is a beautiful card! It almost looks like a little framed piece of art. So lovely! Ha! I love your story of searcing for (and finding) your mojo again! I do love this card! 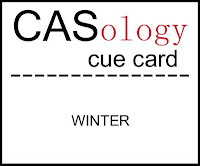 as always your card is the perfect example of CAS!! I aspire to create a card just like this! Looking at this beautiful image is like taking a trip down memory lane! I haven't seen that stamp in ages, but recognized it right away! What a beautiful way to capture the spirit of winter! So beautiful and serene and the fact that it was stamped without a stamp positioner makes it more awe inspiring! haha, I love that you got wild and crazy and stamped without a positioner!! I feel the same way about Christmas & Winter, I'm ready for Spring. I would have never known you had such a hard time creating this card, it is perfect! Oh that is the PERFECT sentiment to go with this stamp and CAS card design! You are totally rocking the Kaleidecolor ink pads these days. Oh, and what did you think about the big news from David Bowie?! Sounds like he was working in secret for two years. You must be so excited! This is just beautiful - I have always loved that stamp. Great color blue. Wow, Ardyth! 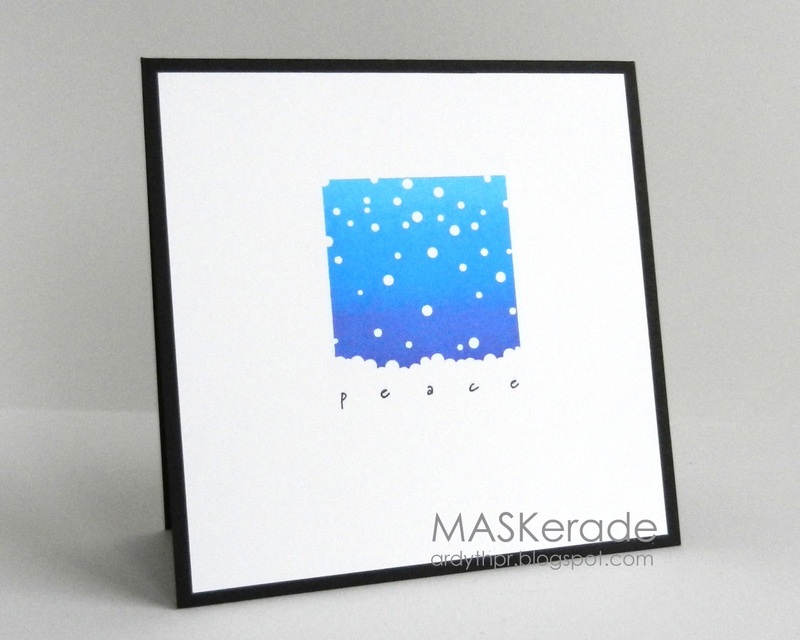 Who would have ever guessed the story behind such a peaceful, serene card! I love your honesty...and we have ALL been there (some of us many a time!)! No mater how it came about, your card is so cool and peaceful...and, of course, pefectly CAS. I am always inspired when I visit your blog!